Keep small items neat, tidy and easily accessible with the colourful VonHaus 4 Drawer Black Mobile Storage Trolley. Stationery, paperwork, cosmetics, toiletries, hair products, toys, groceries, general bits and pieces; this stylish and practical trolley caters to a range of different storage needs. A fantastic addition to homes, offices, beauty salons, hairdressers and more! Lightweight yet sturdy construction with strong steel frame features four deep drawers in a sleek space-saving design. Each drawer measures 36 x 28.5 x 12cm with approx. 10L capacity. 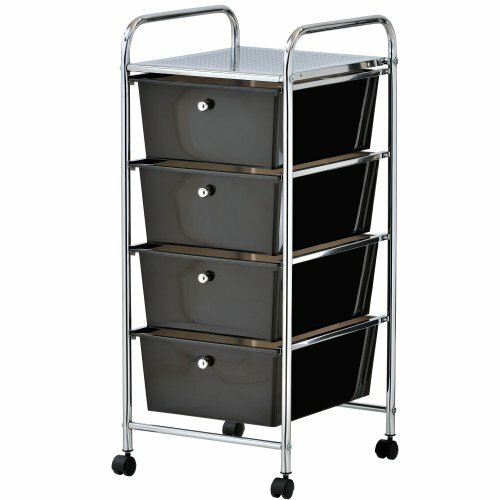 Multi-purpose 4 drawer black storage trolley - great for homes, offices, beauty salons, hairdressers and more!